Bloggers Corinne and Sarah create beautiful miniatures and their blog Small World Land will teach you to bring their magical style into your own home (or your doll’s). I have always wanted a greenhouse of my own. Until that day comes, this miniature greenhouse is keeping me pretty happy. 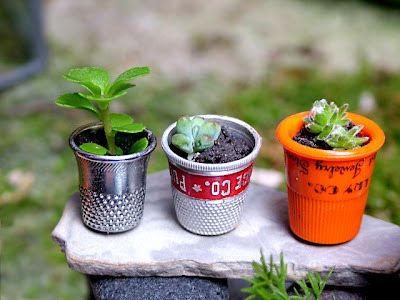 I finally found a good use for all these old thimbles, they make perfect planters for tiny succulent plants. I used a glass terrarium for the greenhouse. 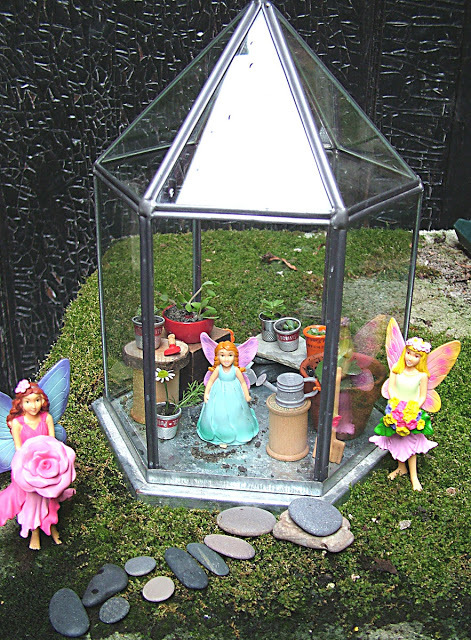 Look around forterrariums and glass domes. There are lots of options out there for creating a small greenhouse. In addition to thimbles I used plastic bottle lids for planters. 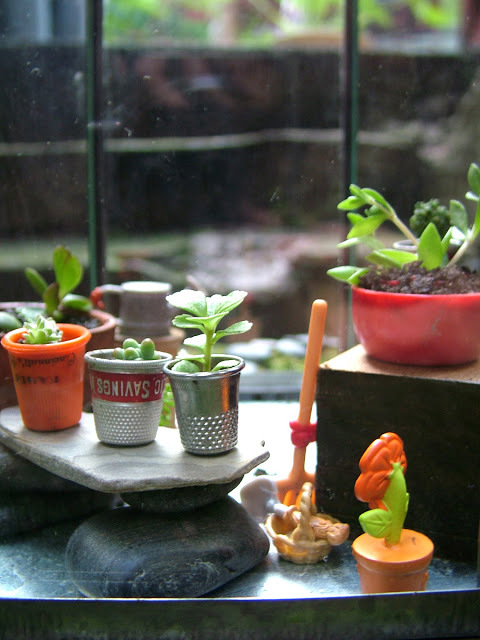 You also can locate very tiny little terracotta pots at dollhouse supply stores. Be creative. Any small waterproof container that can hold dirt will work. I planted tiny plant snips from my yard and from houseplants in the containers. I used some old wooden bobbins and wood block for tables. The kids helped to build the rock table in the back. They loved stacking the rocks. Throw in some tiny tools (your kids may have some from Playmobil or Lego sets) and your greenhouse is ready! Set it outside, and if you’re lucky, you may have some little visitors! This entry was posted in Crafts, Floral Crafts, Home Decor, Kid's Crafts, Recycled Crafts, Spring and tagged Green Crafting, Guest Bloggers, Recycled Crafts on December 8, 2012 by Guest Blogger.